* Wasn’t that small for a friend that works in Sano, stuff danced for their shelfs and most likely at his home too. They were close to where it originated. 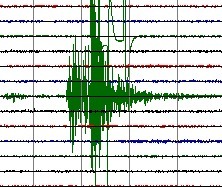 Still getting shakes minutes after the first tremor. * We live in an older apartment in Kuki in Saitama, I thought my fridge was gonna fall over, some cups fell off the shelf. Me and the kids stood in the genkan with the door opened a spot, just in case it got bigger all of a sudden, freaked me out ! The kids just went back to playing! * Over here, in western Tokyo, it was not too bad rather lengthy though. * In Sonic City, Saitama, the Japan Philharmonic was about 12 minutes into the first movement of Tchaikovsky’s first Piano Concerto. There was a long, deep rumbling sound which I knew was not coming from any timpani – and the floor moved up and down very visibly for a few seconds, people gasping, thinking no doubt “not again!” – But the Orchestra and pianist Michie Koyama just kept on playing and never missed a beat! Well done, great concert! The Japan Meteorological Center gets numerous felt reports from Tokyo and neighboring town people. JMC gives for this earthquake a value of M 4.7 (a lot less) and a depth of 50 km. The maximum received values in some close by prefectures (Tochigi and Saitama) are IV JMA = Many people are frightened. A moderate earthquake just struck Tokyo, Japan. We presently give it a ORANGE / GREEN color as the Magnitude is moderate and the depth at 60 km also moderate. Normally this gives no damage or injuries, but as the area is so heavily populated we tend to give it also an ORANGE color. One of our QuakeSOS app users did send a quick I AM SAFE message, which he only does when the earthquake is really well felt. 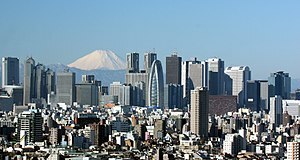 Japanese houses are almost all earthquake proof build. The area has a lot of earthquakes, but most of them have an epicenter in the coastal waters. Recent quakes of this Magnitude occurred frequently in the Narita airport area. All the data (magnitude, depth and location) are still preliminary at this point. This is an example of the many aftershocks which are still striking the Christchurch area. On October 14 we had a M 4.1 aftershock and and on October 13 even a M 5.0 at 20 km of Christchurch. None of these events have been reported by USGS or EMSC. We do not understand the system behind reporting or not reporting. Shallow depth at 25.5 km. Harmless earthquake at this magnitude. Epicenter near Bald Knob and 25 km from Conway. Average depth without any potential danger. At least 50 km from the closest islands. Deep hypocenter (normal for this area) almost under the Salar de Surire National Monument. Close to the border with Bolivia. Aftershock of a much more powerful earthquake which occurred at the same depth a couple of months ago. Almost on the beach of Sincheng township. Below a nearly ‘live’ picture of the earthquake registering station “Matsushiro” in Japan. We have used the names of Seismograph and Seismogram, because both names are used in different parts of the world. They mean the same. Please use the seismographs in conjunction with our earthquake list and reporting. Often the seismograph indicates local events which have nothing to do with earthquakes, are being maintained or do not work. All this happens beyond our knowledge. We bring the seismograph ‘as it is’. Time is UTC time (Universal Time). Clicking on the picture will bring you to the corresponding USGS page. Epicenter in the trench on a safe distance of Crete. Very deep in the mantle of the earth. Epicenter amids a number of small islands. Epicenter in the same area as yesterday. Serious shock, but people in this area are used to this kind of quakes. Big distance from the nearest atolls. For your comfort, we will provide in most cases Google Satellite Map links to give you an idea where the earthquake struck, which terrain it happened and if villages or cities are located in the immediate vicinity. The page is regularly updated to add new quakes. Minor earthquakes are earthquakes without or with little damage risk. In most cases these earthquakes have a Magnitude smaller than M 5.0 OR earthquakes with an hypocenter (depth) of more than 100 km OR earthquakes up to M 5.9 with an epicenter far away from populated areas. A series of moderate earthquakes far away from inhabited places and right on top of the Fault Line, where the North American Plate meets the African Plate. M 4.5 2010/08/07 01:28:28 Depth 83 km PAPUA NEW GUINEA, P.N.G.